In 2000, Christine Vega Villarreal a high school senior in San Fernando, California, was still unsure of what she would do after high school. As a first generation student who grew up with immigrant parents from Mexico, she did not have the necessary tools and resources to support her as she considered her options. Likewise, her high school trajectory, due to “tracking,” did not provide Christine the support she needed while in high school. She faced marginalization due to her English Learner (EL) status and was placed in remedial courses. Christine struggled with meeting expectations regarding academic rigor, and found herself increasingly disengaged in class. She began to skip school. It was through the encouragement of her art teacher and classmates, and after many visits to the counselor’s office, that she was able to be placed in Advanced Placement (AP) courses. She struggled at first but eventually these AP courses made her re-engage fully. Christine Vega Villarreal with her partner Alfredo Huante, a Ph.D. 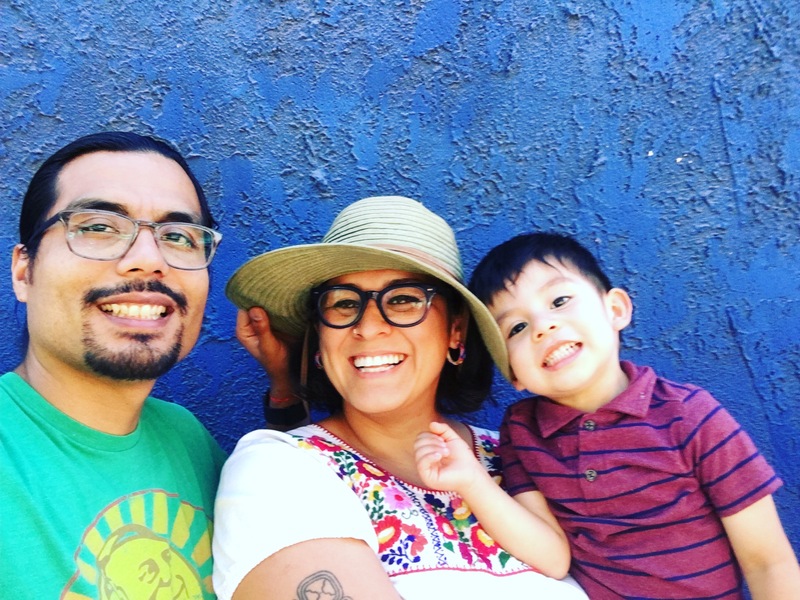 Candidate in the Department of Sociology at the University of Southern California, and their son, Janitzio Huante-Vega. Christine is a first-generation U.S. citizen. Much like many EL students who are U.S. citizens, immigrants and refugees, Christine faced linguistic and resource barriers that limited opportunities. EL students, in fact, tend to face opportunity and achievement gaps and experience lower college going rates. By the time EL students reach 12th grade most have the necessary English skills for daily life but many lack the language proficiency needed to succeed in college. This expected language proficiency deals with mastery of academic vocabulary, discourse style, formality, and complexity of syntax. To successfully transition EL students like Christine to postsecondary education and training, both secondary and postsecondary institutions must understand the unique challenges EL students face and increase their support mechanisms for EL students. Without this understanding and support, entry into postsecondary education might not result in successful completion. You may wonder whether Christine’s experience is unique. Data tell us it is not. This blog is cross-posted from the White House site. As President Obama recently reminded us, “We can never say it often or loudly enough: Immigrants and refugees revitalize and renew America.” Many immigrants and refugees arrive in the United States having already completed extensive education and job training, or with significant work experience abroad. However, all too often they face challenges to fully utilizing these skills. Yet as the White House Task Force on New Americans One-Year Progress Report highlighted, there are communities that are developing programs to help skilled immigrants return to their careers in their new home. The Task Force is seeking to support communities that are focused on finding solutions to this challenge through its National Skills and Credential Institute. This peer-learning forum aims to connect a consortium of leaders from state and local workforce areas; adult and post-secondary education systems and institutions; representatives from departments of labor, licensing, and regulatory affairs; immigrant serving organizations; and external technical assistance providers. The goal of this institute is to help communities understand how policies and practices help or hinder credential attainment and recognition, and to assist in developing strategies for how the public, private and nonprofit sectors can strengthen career pathways for skilled immigrants. The Task Force will host this exciting forum at the White House, in partnership with the Departments of Education, Health and Human Services, and Labor on June 29, 2016. Communities are invited to submit a letter of interest by May 1, 2016. To learn more about this exciting opportunity, click here. June is Immigrant Heritage Month. In recognition of the work the adult education community is doing to support the diverse linguistic and cultural assets of immigrants, OCTAE is featuring the following blog by Nancy Fritz, Assistant Coordinator at the Rhode Island Family Literacy Initiative. My journey in adult education began in 1986 when I signed up as an adult literacy volunteer with Literacy Volunteers of America. With a longstanding interest in languages and having previously taught high school civics and history, I immediately loved it and I knew I wanted to work on the field of adult education and enrolled in some graduate classes. Like many ESOL instructors, I pieced together my work through part-time positions for several adult education agencies including at a public library. Luckily, I was able to obtain a full-time position at one agency as a teacher and then as an Education Director. For the past 4 years, I have worked for the Rhode Island Family Literacy Initiative (RIFLI). RIFLI was founded sixteen years ago when libraries began receiving increasing requests from recent immigrants for English as a Second Language (ESL) services. The Providence Public Library (PPL) responded by implementing a family literacy program at one branch library. The program has grown significantly since then and RIFLI now provides classes in six library systems, in the public schools to the parents of children, in businesses for employees, and in our local One Stop employment center. We offer ESL, Citizenship, Digital Literacy, Transition to College and Career, Math, and Conversation classes. RIFLI serves approximately 300 adults per year. Rigoberto Alvarado left El Salvador in 1991 in search of a better life in the United States. He needed English and a job. With the help of friends and family, he found an English class at the Neighborhood Centers’ Oakland Adult and Career Education. He started learning English. He found a job he liked in the hospitality industry. But he quickly realized he needed more skills in order to advance, so he returned to Neighborhood Centers to learn about computers and computer applications. Through hard work and dedication to his education, Rigoberto advanced through the ranks to become banquet manager at the Waterfront Hotel in Jack London Square. He now hires and supervises many employees, manages costs and inventories, and strives to create a positive employee work environment. Rigoberto put himself on the path to the middle class. As Rigoberto’s experience indicates, employment-focused literacy and numeracy, as well as job skills are critical to the prosperity and well-being of individuals. One third of the 36 million adults with low skills in our country are immigrants or refugees like Rigoberto but they have not yet had the opportunities he has had. Our current programs can only offer English language learning opportunities to about 678,000 adult English learners per year. Unless we create additional opportunities for them, these twelve million adults will have a harder time finding a well-paying job than their higher skilled peers. Making Skills Everyone’s Business – which was released on February 24 – makes a commitment to closing the equity gap for immigrants and refugees and other adults with multiple barriers including adults with disabilities, returning citizens, homeless adults, and emancipated youth transitioning out of the foster care system. Closing the equity gap is one of the seven strategies included in this national call to transform adult learning. Data from the Survey of Adult Skills support this strategy. For instance, adults with learning disabilities are twice as likely to have low skills but few programs are equipped to meet these adult learners’ unique needs. Twenty-six percent of adults at Level 1 and 9 percent of those below Level 1 reported a learning disability. The figure below, Figure 9 in the Making Skills Everyone’s Business report, demonstrates the challenge. One subpopulation that requires our attention and commitment are older youth and adults in our correctional facilities. Data on the skills of the incarcerated and on returning citizens are forthcoming, as the National Center for Educations Statistics is completing data collection on a representative sample of institutionalized individuals. Conclusive data are available, however, that show that career-oriented education is one of the more effective interventions that contribute to significant reductions in recidivism according to a recent meta-analysis, Evaluating the Effectiveness of Correctional Education, conducted by the Rand Corporation. OCTAE’s expanding investments in adult and youth reentry education programs and the expanded provisions for corrections education in the Workforce Innovation and Opportunity Act are just the beginning. We need to work directly with employers to create pathways from prison to good jobs. Partnerships with employers, employment and training agencies, agencies that can support wrap around support services, and integrated education and training programs that simultaneously provide skills remediation and postsecondary education and training are doable and can create real opportunities. But these partnerships and services demand more resources. In addition to demanding resources, we should have the political will to create more opportunities. When I traveled all across the country gathering input for Making Skills Everyone’s Business, adult learners told me repeatedly that they are ready to take advantage of the opportunities to improve their skills. Let’s work together to make it happen. Guest Author: Dr. Brenda Dann-Messier is the former Assistant Secretary for Career, Technical, and Adult Education at the U.S. Department of Education. Dann-Messier launched the national engagement process that resulted in Making Skills Everyone’s Business. On Nov. 21, 2014, President Barack Obama issued a memorandum establishing a White House Task Force on New Americans, an interagency effort to develop a coordinated federal strategy to better integrate new Americans into communities. Read more about the Task Force and the call for feedback. During these listening sessions, Task Force members, including OCTAE leaders, and USCIS officials will provide an overview of the Task Force on New Americans and seek your feedback on best practices or strategies for successfully integrating immigrants and refugees into local communities. Once USCIS processes your registration, you will receive a confirmation email with additional details. If you have any questions about the registration process, or if you do not receive a confirmation email within two business days, please email Public.Engagement@uscis.dhs.gov. Note to the media: This engagement is not for press purposes. Please contact the USCIS Press Office at (202) 272-1200 for any media inquiries. If you have questions regarding the engagement or other stakeholder matters, please email Public.Engagement@uscis.dhs.gov. Contribute to this Call for Ideas from the White House Task Force on New Americans! The goal of the Task Force is to develop a federal immigrant integration strategy that allows new Americans to contribute to society to their fullest potential and bring new Americans together with their receiving communities to strengthen communities. OCTAE’s programs are often the first educational stop for many immigrant and refugee families. Our practitioners can inform the Task Force with real-life stories and examples of specific actions and supports that could help immigrants and refugees integrate into their communities and for their communities to welcome them. The Task Force needs to hear from you. In a White House blog post, the Task Force posted this Call for Ideas to help shape the focus of the federal immigration and refugee integration strategy and created a specific email account, NewAmericans@who.eop.gov, for gathering stakeholder ideas. Please send your ideas, big or small, to this email by February 9, 2015.